This was my first time fishing Western New York’s tributaries for salmon and trout and while I’ve fished with huge crowds for the Pennsylvania trout open I’ve never experienced anything like this, not even on The Salmon River in Pulaski. It was insane. The creek we fished (this one was Eighteenmile) was more than packed. If there weren’t at least 250 anglers fishing the hole I would be surprised and that was from sunrise to sunset. There were never fewer than 150 anglers at any point during the day and that’s with guys coming and going. There’s an audience of anglers waiting for a spot to open up. When one guy leaves, another steps in. What also surprised me was the number of trout and salmon in this huge hole. Wherever there was current the fish were stacked from the bottom to the surface. This is my first time here so I’m not expert, but we did hook a ton of fish and landed a handful. 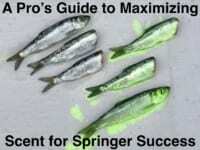 There are so many anglers it can make it hard to land them as lines cross each other. On the other hand, I was surprised at how well anglers got along, at least on this day. With as many fish as there were in this combat zone most locals told us the run had just started and wasn’t going to peak for another two weeks. With that said there’s still plenty of time to target salmon in Western NY. This creek (Eighteenmile Mile), Oak Orchard, the Genesee and other are loaded with fish. Here we caught salmon, steelhead and browns in the same hole. Personally, I caught a coho, kings and browns, but couldn’t get a steelhead to bite. My fishing buddy did catch a steelhead. We caught some enormous fish and lost many more. All our success came on egg sacks. We didn’t use skein this time around like we used on the Salmon River a few weeks ago. We used loose steelhead eggs cured in Natural Fire Brine and fresh king salmon eggs cured in Natural Fire Brine. Regardless of what kind of egg we used they were tied chartreuse or pink netting. My buddy Dave Winberg of Steel City Anglers fished Oak Orchard nearby and did well with Pink and Orange BorX O Fire cured skein and single eggs, so both methods were effective throughout the region. Cured skein/eggs was clearly the best method. We put about 12 steelhead eggs to a sack or five king eggs. The sack was about the size of a marble. This time around I used eight-pound Vanish, but I wouldn’t recommend that. We lost too many fish. Instead I’d use at least 10-pound test and make sure it’s a fluorocarbon line because the water is clear, at least when they weren’t generating. We could see the fish as it cleared following releases. Size varied. On the kings we saw fish from five on up to 30 pounds. The average fish ran 15-20 pounds. We saw brown trout from five to 15 pounds. There were plenty of coho around, but the kings clearly outnumbered them. When it came to steelhead they were fairly small, but were aggressively looking for eggs. Editor’s Note: Joey Usher operates SWPA Fishing. For more information on his adventures please visit https://www.facebook.com/FISHSWPA. 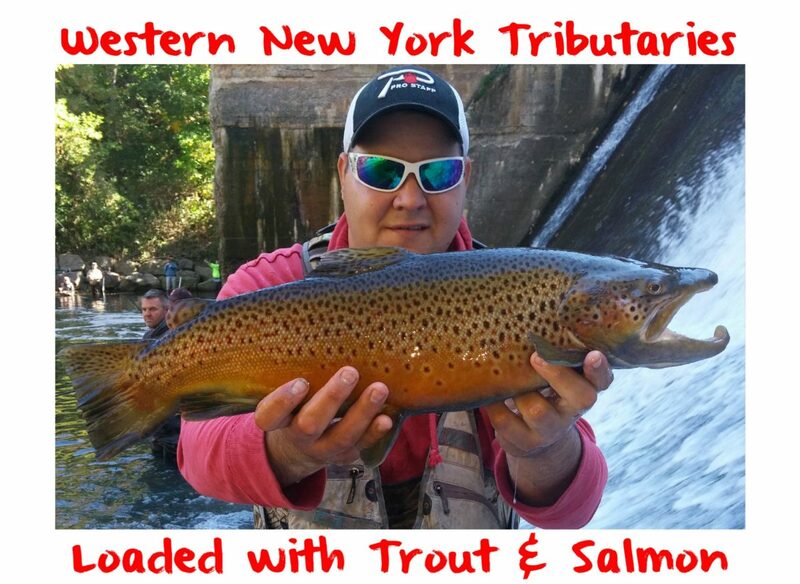 For more information on fishing Western NY for salmon and trout please visit the New York Department of Environmental Conservation http://www.dec.ny.gov/outdoor/fishing.html.